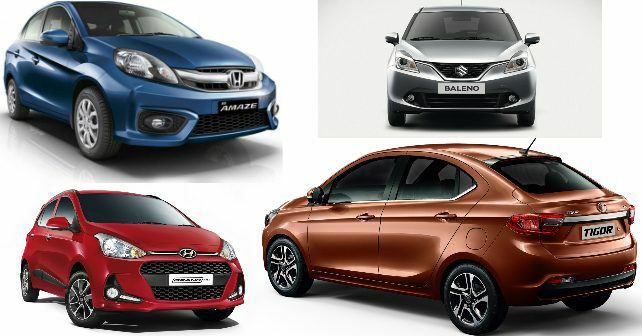 How does the newly launched Tata Tigor stack up against some of the other similarly priced cars in the market? Tata first showcased the Kite 5, the concept form of the Tigor at the 2016 Auto Expo last year. The Sanand-based car maker then unveiled the Tigor in its production form at the 2017 Geneva Motor Show in March this year and launched it in the Indian market on 29th of the same month. The Tigor has been priced from Rs 4.7 lakh to Rs 7.09 lakh (ex-showroom Delhi). The price that it comes at, the Tata Tigor will have to hold its own not just against compact sedans but also some of the hatchbacks on sale in India. Take a closer look at how it stacks up against its rivals. At the heart of the Tata Tigor are the same petrol and diesel engine options that worksforce on the Tiago. It comes with a three-cylinder 1.2-litre Revotron gasoline motor that is good for 83bhp and 114Nm. While the diesel is also a three-pot motor, it makes just 69bhp and 140Nm from a 1.05-litre unit. Both engines come mated to a 5-speed manual transmission. Tata has recently launched the Tiago with an AMT and the same transmission will eventually also make its way into the Tigor. Just a few months before the launch of the Tigor, Hyundai brought in the facelifted Grand i10. While most updates to the facelift were cosmetic, Hyundai plonked a new diesel motor to the Grand i10. The mid-sized hatchback now comes with a 3-cylinder 1.2-litre diesel motor that develops 74bhp and 194Nm. The petrol on the other hand is the same motor as in the pre-facelift model – a 4-pot 1.2-litre unit that produces 82bhp and 116Nm. Both these engines come mated to a 5-speed manual transmission, the petrol also comes with a 4-speed automatic. The key feature of the Maruti Suzuki Baleno and the Honda Amaze is that both cars, in their petrol and diesel variants come with a 4-cylinder motor. The Baleno too sports a 1.2-litre motor pumping 83bhp and 115Nm. This engine comes mated to a 5-speed manual or a CVT. The diesel on the other hand is Maruti Suzuki’s bread and butter 1.3-litre diesel that churns out 74bhp and 190Nm and comes mated to a 5-speed manual. In the petrol as well as the diesel avatar, the Honda Amaze is the most powerful of the lot. It makes 87bhp and 109Nm from a 1.5-litre petrol unit. The diesel too displaces 1.5-litres and developing 99bhp and 200Nm. Like the Baleno, only the petrol Amaze comes with an automatic transmission. The Tigor, Grand i10 as well as the Baleno make more or less the similar output figures in their petrol avatars. The Tata offering is clearly has least powerful diesel motor while the Amaze has the punchiest. Let’s get the common features out of the way first, shall we? The top-end trims of all cars come with steering mounted controls, electronic climate control, electrically adjustable ORVMs, driver seat height adjust, rear defogger, central locking and more. In terms of safety, all cars come with dual airbags up front and anti-lock braking system. In fact, all cars are even come fitted with Electronic Brakeforce Distribution with the exception of the Hyundai Grand i10. The Tata, Maruti Suzuki as well as the Hyundai offerings come with reversing camera with parking sensors and a touchscreen infotainment system with navigation and more. Projector headlamps have been fitted onto the Tigor and the Baleno, the other two cars get conventional headlamps. The Baleno and the Grand i10 come with leather wrapped steering and gear knob, something that is missing from both the other cars. Maruti Suzuki’s representative in this comparison is the only car to come with tilt and telescopic steering adjust while all others just have tilt adjustment. Hyundai on the other hand, is the only car among these to come fitted with a rear AC vent. The Tigor, Grand i10 as well as the Baleno are equally matched in terms of features while the Amaze is undoubtedly the least equipped of the lot.